We are a turn-key operation. Just point us to the weeds and we do the rest. Every property is different and everyone has different landscape objectives. That’s why we like to come and visit you, take a look at your property and your weeds, and talk to you about what you want to accomplish. We charge per acre. Our process is simple. Initially, we’ll come meet with you and discuss what area you want cleared and how fast you want it done. The size and topography of the area will determine how many goats are needed. After we come to agreement, we’ll provide you with an estimate for the job. Once you give us the “green light” and sign the service agreement, we bring in the goats on an agreed-upon schedule. We require a 50-percent deposit when you sign the contract. Nothing. When we arrive, we’ll put up temporary fencing (self-powered, electrified netting) if needed, and turn out the goats. We provide everything the goats need, including water troughs and nutritional supplements (again, if needed). 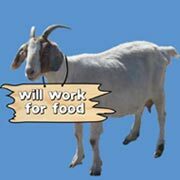 We Rent Goats® will supervise the goats while they’re on your property. And when we leave, we’ll remove all evidence that the goats were ever there—except, of course, for your now weed-free property (and a little bit of fertilizer). How many goats are we talking about? We prefer to do jobs that require at least 100 goats. Typically, 100 goats will eat around a half acre a day depending on the amount of vegetation (if the weeds are tall and thick, it will take longer). If you want us to just remove one noxious weed out of your pasture, we move the goats a lot faster so they don’t eat the vegetation (usually grasses) you want to keep. Our goal is to come in and wipe out your weeds and brush as quickly as possible. If your job is small, we might bring in fewer goats. But we’ll still get it done fast. We serve farmers, ranchers, public land managers, homeowners and property managers in the Treasure Valley of Southwestern Idaho. Can a group of people join together to hire you? Yes. If you and your neighbors all have weed problems or want protection from wildfires, we’re happy to work with you as a group. We can save time and money by not having to set up separate electric fencing or transport the goats from one plot of land to another.